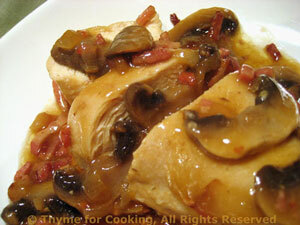 Chicken Breasts, Bacon, Mushrooms, Thyme for Cooking gourmet menus. 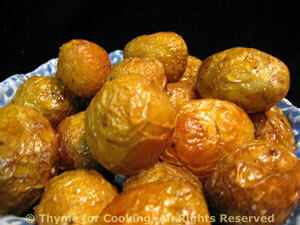 New potatoes are very thin-skinned, immature potatoes. They have a short shelf life, usually only a few days before they start turning green and need to be added to the compost pile. You probably can only get them at the farmer's markets - but try, if you can. They're worth it. If not, substitute the small 'creamer' potatoes. Remove from oil, put into a small dish and serve. A bit of sugar emphasized the natural sweetness of the carrots. If you have a rippled knife it makes these quite pretty. 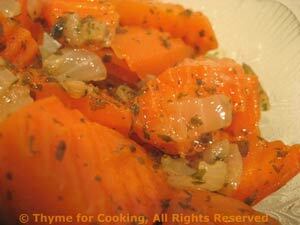 Put carrots and onions in a small sauté pan. Add stock, cover and cook, 15 - 20 minutes or until vegetables are done. Remove cover, turn heat to medium-high and cook off all but 2 tbs of liquid. Add butter and sugar, stirring to dissolve sugar. Sauté until reduced to a glaze, stirring often.